Drixoral Decongestant Nasal Pump,Drixoral Decongestant Nasal Pump-Helps you breathe better! 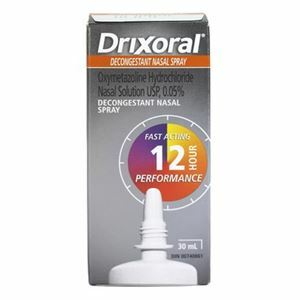 Drixoral Decongestant Nasal Pump-Helps you breathe better! Drixoral Decongestant nasal pump relievs the symptoms of nasal congestion, hay fever, sinus congestion and other allergies. It contains Oxymetazoline Hydrochloride Nasal Solution USP, 0.05%. Other non medicinal ingredients include Benzalkonium chloride solution, edetate disodium, propylene glycol, sodium phosphate monobasic, water, and hydrochloric acid or sodium hydroxide to adjust pH. Important Features of Drixoral Decongestant nasal pump are that it is a fast acting formula which has its effect until 12 hours. The dosage recommended for adults and children above 12 years of age is 2 to 3 sprays in each nostril 2 times a day every 12 hours. Maxiumum dosage is 2 per day. The bottle should be squeezed firmly and head should not be in tilted positon. The nozzle should be cleaned after each dosage to maintain hygiene. This medication should not be used by people suffering from hypertension, thyroid problem, diabetes, pregnant women and lactating mothers. Medicine should not be taken more than the recommended dosage. If the symptoms do not improve within 3 days, then a doctor should be consulted. Although not common, some of the side effects that may occur are burning sensation, stinging, sneezing and increase in nasal discharge.